With a tough opening few rounds, JG Speedfit Kawasaki rider James ‘Westy’ Westmoreland marked his return to form at Thruxton with an emotional maiden MCE British Superbike Championship rostrum. It was a disaster forJames Ellison however, as a blown engine from the bike in front of him dropped oil on the track, seeing him crash at high speeds and breaking his wrist in the process. Following the accident Ellison has been undertaking sessions in the Hyperbaric Chamber, along with sessions of muscle stimulation and ultrasound, to speed up recovery time. However despite having the cast removed on Monday, the bone has not quite fully healed and he has been ruled out of this weekend’s action. He will make his racing return at Oulton Park, with the team planning to have him out testing the JG Speedfit Kawasaki machine beforehand. 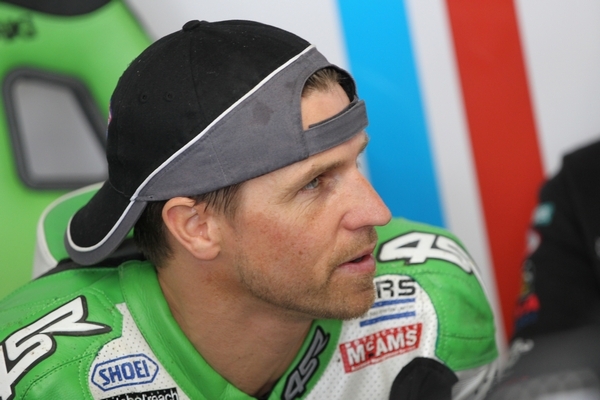 With the picturesque Cadwell Park circuit being one of the most challenging on the MCE British Superbike Calendar, Westy will be fronting the sole JG Speedfit Kawasaki attack at the annual fan favourite ‘Party in the Park’. The team enjoyed a strong test around the 2.18 mile circuit last week, working through a number of settings which will allow them to hit the ground running for opening Free Practice on Friday morning. Eager to make a return to the podium, James Westmoreland said, “After Thruxton I’m really looking forward to going to Cadwell, my home round, ready to push at the front once again. It’s a unique track and is always a special event with the crowds packing the banking opposite the start finish straight helping to create a really exciting atmosphere. Disappointed to miss the Cadwell Park round, James Ellison added “It is really disappointing to not be able to race this weekend at Cadwell, it’s a fantastic circuit and one I’ve had some good results at in the past. I know Westy will be doing the business for the JG Speedfit Kawasaki team though and I’ll be coming along on Sunday to support him. JG Speedfit Kawasaki Team Principal Mark Smith-Halvorsen added, “It’s a real shame for James to be missing this weekend, particularly after all the effort he has put in. However Westy showed last time out his capable of running at the very front of the British Superbike pack and had a strong test here recently, so we head into one of the most popular rounds of the year looking to add to our podium tally!